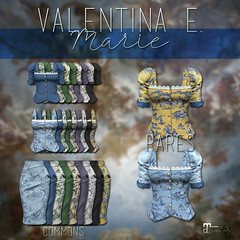 September 2012 – Valentina E.
The October cycle of FaMESHed is about to open! Find this new ‘Sunday Knit’ dress in 4 different colors, exclusively at this monthly event. These cozy cable knit sweaters are also available only at this special event. Stay warm! Our first Fall release is now out at Valentina E. Check out this cozy belted knit coat, perfectly worn with smart tweed trousers and a two tone pullover. Find all pieces in a number of different finishes. All items are now available at our main store or on The Marketplace. Get your choice of either of these Paris print dresses for just 75L for Lady Sunday. Only at our main location this Sunday! Coming soon..our new mesh sweater coat, two tone sweater, and tweed trousers, all for fall and 100% mesh. 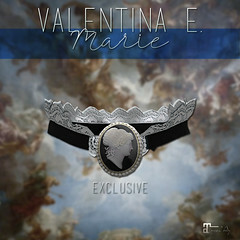 Valentina E. 4 Vinyl Cafe Group Gift!